The Kona Process 153 29er looks like it’s ready to party. 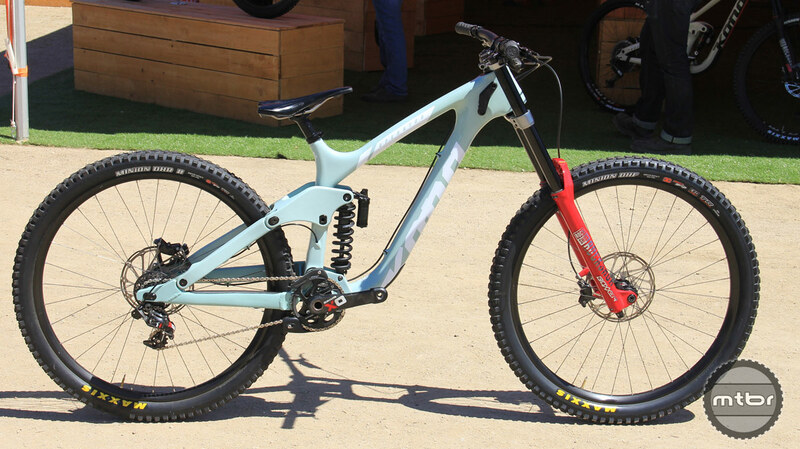 Kona took some of their best alloy bikes and created carbon versions that were on display at the Sea Otter Classic. These bikes are very close to the alloy models with some slight changes. The Kona Process 153 29 linkage. The Process 153 29 has the same geometry as the alloy version, with 160/153mm front and rear travel and 29er wheels. 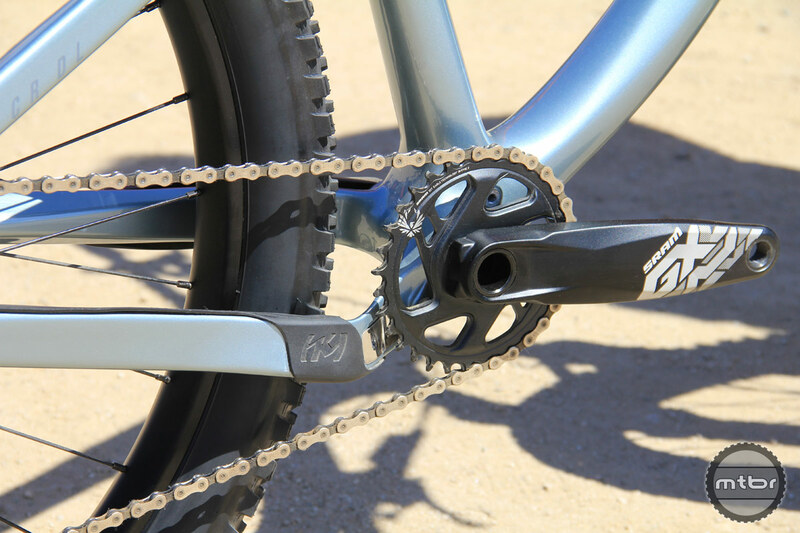 Its chainstays are claimed to accommodate up to 2.5 tires, depending on manufacturer. 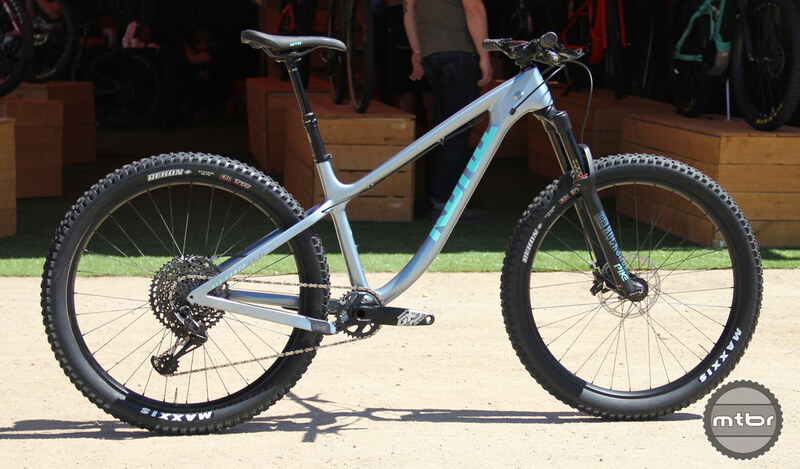 The final version will differ slightly from the photos, including being spec’d with top of the line RockShox Lyrik and Super Deluxe suspension. If you are a shorter rider, rejoice, the medium frame seat tube has a 250mm insertion length, so it should still accommodate up to a 170mm travel dropper post. The Kona Process 153 29 has updated cable routing, eliminating the need to remove the shock and open the brake line. Cable routing was also improved, with the derailleur and rear brake lines outside the shock mount to make servicing easier. It will be available in M, L and XL sizes. Pricing is TBD. The Kona Big Honzo shown here with 27.5×2.8 tires. The Big Honzo also now has a carbon frame option. Maximum tire width for 27.5 wheels is 3.0 and 29er can fit up to 2.5 tires. The biggest difference from the alloy frame is the asymmetric chainstay, shown below. Geometry numbers align with the alloy frame and pricing is TBD. Kona Big Honzo CR with its asymmetric chainstays. Kona has also debuted a carbon Operator. 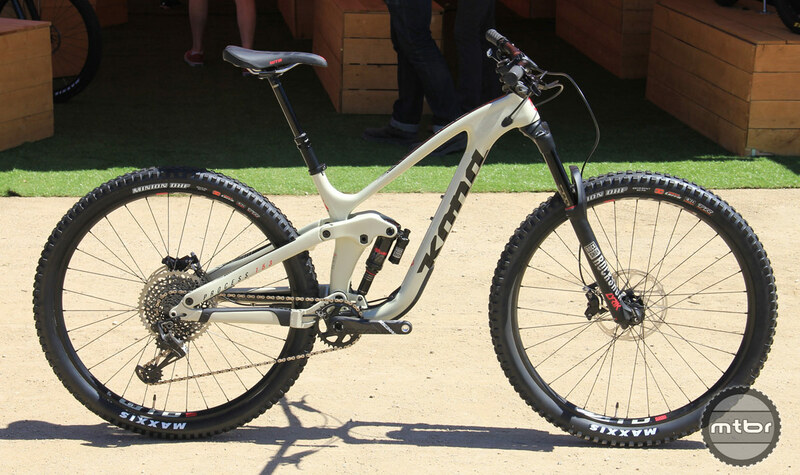 It can run 27.5 or 29er wheels, though Kona plans to sell only one of the configurations, which is, you guessed it, TBD. The new Kona Carbon Operator with 29er wheels. There are multiple geometry options for the Carbon Operator, with a flip chip on the seat stay to maintain bottom bracket height between wheel sizes. 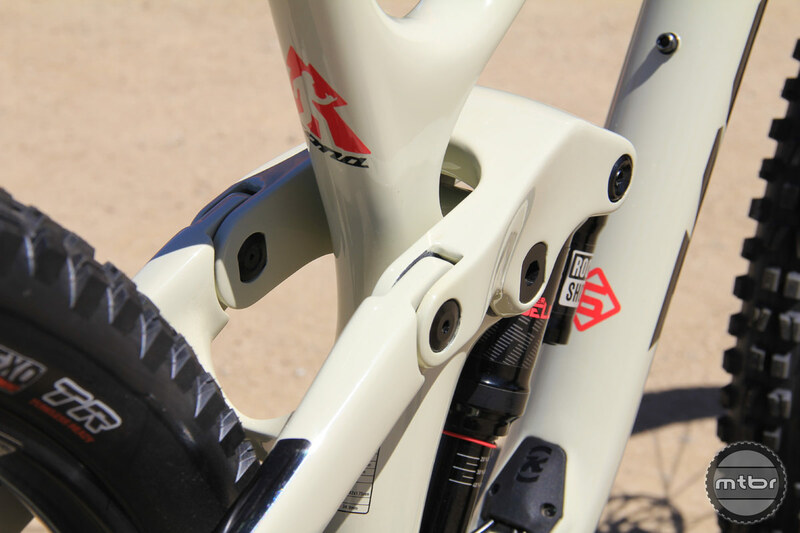 The user can also select between 425 or 440mm chainstay length and reach is adjustable at either neutral or +10mm. Other geo numbers follow the 2018 Alloy Operator chart. The Kona Carbon Operator has stealth cable routing and a massive linkage. Travel for 29er wheels is 195/190mm f/r and the 27.5 gets 200+/200mm f/r. 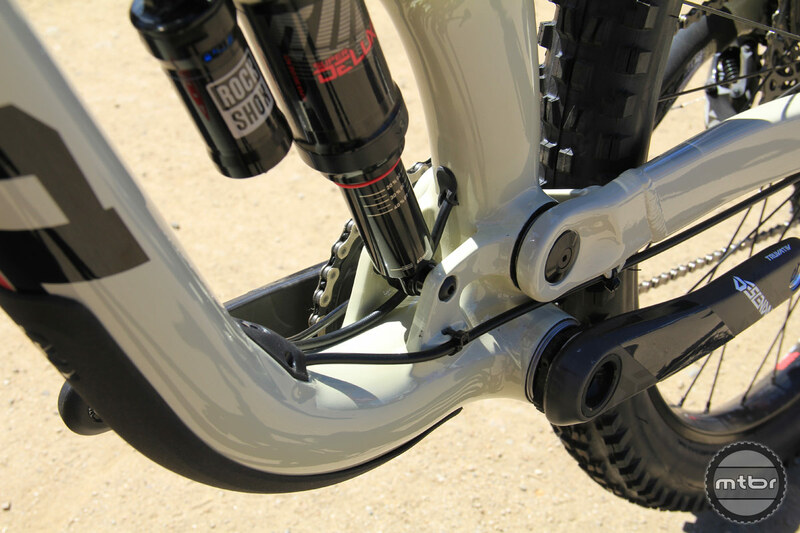 The Carbon Operator uses a metric trunnion shock to maximize usable range. As with the other bikes, pricing is TBD. For more information, visit www.konaworld.com. This article is part of Mtbr’s coverage of the 2018 Sea Otter Classic in Monterey, California. 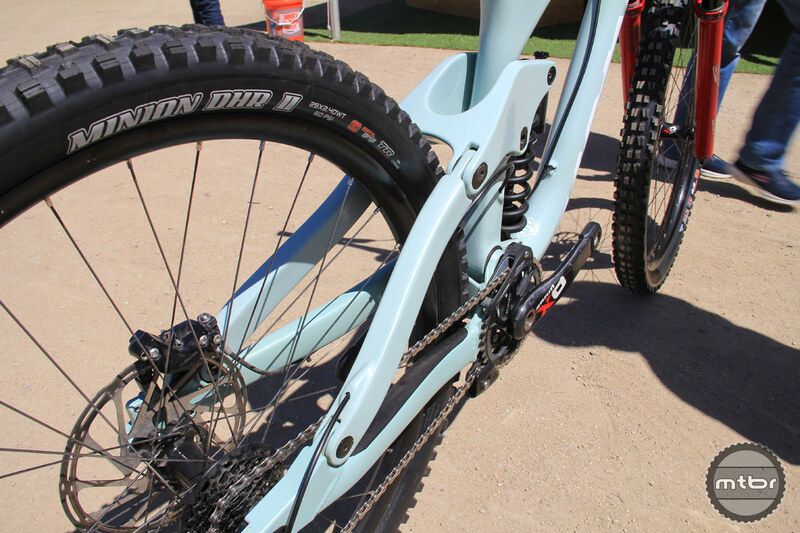 For more from Sea Otter CLICK HERE. The Kona Process 153 29 looks like it’s ready to party. The Kona Process 153 29 updated cable routing, eliminating the need to remove the shock and open the brake line for routing. The Kona Big Honzo looks like a blast to ride! Shown with 27.5×2.8” tires. Kona Big Honzo CR, asymmetric chainstays. Kona Carbon Operator, shown with 29” wheels. Kona Carbon Operator, cable routing and massive linkage.